Canada's military is considering lifting a longstanding citizenship requirement as a way to boost its numbers. Right now, Canadian citizenship is a key requirement for enlistment, with waivers offered in exceptional cases. Canada's military is considering lifting a longstanding citizenship requirement as a way to boost its numbers. "In line with the government of Canada's objective of raising the numbers of Forces personnel, there are currently initial discussions to review the possibility for foreign nationals' recruitment beyond skills applicants," Byrne Furlong, spokeswoman for Defence Minister Harjit Sajjan, wrote in an email. "It is too early to mention anything about any results or conclusion of such review‎." DND spokesman Maj. Alexandre Munoz said the existing Skilled Military Foreign Applicant program is open to any foreign applicant with a specialized skill set that would reduce training costs or fill particular needs — a trained pilot or a doctor, to cite two examples. Only two foreign nationals were accepted into the Forces last fiscal year. "It is understood that many foreign nationals and permanent residents have applied to join the CAF, but the majority have been refused as they do not meet IRCC guidelines and requirements," Munoz said in an email. Lifting the Forces' citizenship requirement would be a sharp departure from Canada's traditional recruitment practices and could open the doors to applications from thousands of permanent residents. Vancouver immigration lawyer Zool Suleman said he supports the change. He argues that recruitment should be based on capability, not on whether the candidate is a citizen or on the path to become one. "I think people can be tested and examined in terms of security and ability and should be able to serve if they want to serve," he said. "If you are loyal to Canada, if you have lived here a short time but you really understand what Canada is about and you really want to serve this country in that way, I don't understand why permanent residents should not be allowed to serve." Other countries — the U.S. among them — allow non-citizens to serve, with certain restrictions on the positions and ranks they can hold. "Green card holders have always been welcome to serve and (are) a key component of our military team," said U.S. Department of Defence spokeswoman Major Carla Gleason in an email. "Expedited citizenship is offered to service members who have completed initial training and 180 days of consecutive honourable service." The British army also welcomes citizens of Commonwealth countries into its ranks, while the French Foreign Legion recruits soldiers from countries around the world. While the CAF recently has seen a modest increase in the number of military personnel, it is still struggling to reach full strength, falling about 2,000 short in regular-force members and 5,300 in reservists. Matthew Overton, executive director of the Conference of Defence Associations Institute and a retired brigadier-general who commanded the Forces recruiting group, said there are potential benefits and risks to allowing foreign nationals to join the Canadian Armed Forces. "It's not simply that it will be opening a door to more people who can do jobs in the Forces. It's going to come with some complexity that we're not used to dealing with on a regular basis," he said. "So we'd have to really think about that and be prepared to deal with some of those issues on a case-by-case basis with those individuals, to think about what that means." In 2016, the RCMP scrapped its citizenship requirement, allowing permanent residents who have lived in Canada more than 10 years to apply. The goal was, in part, to boost diversity in the ranks. 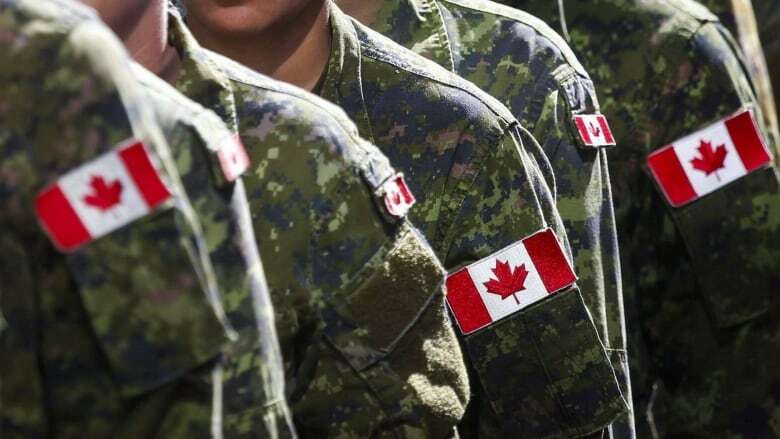 Lifting the citizenship requirement could help meet the military's equity targets, which aim to have an Armed Forces composed of 25.1 per cent women, 3.5 per cent Indigenous people and 11.8 per cent visible minorities. The current Forces makeup is 15.4 per cent women, 2.8 per cent Indigenous and 8.2 per cent visible minorities, though some choose not to not self-identify as belonging to one of the targeted groups. Overton said there are benefits to increased diversity which could be enhanced by opening recruitment to permanent residents. "Be aware of the individual and their circumstance, as we would be with looking at anyone for the Armed Forces, and take advantage of the opportunities, of the skills, knowledge sets and some of the understandings that they bring with them that would help Canada do a better job in influencing the world," he said. In June 2014, the Conservatives established a new program that allowed foreign nationals who served with the Forces to apply for fast-tracked citizenship. According to figures provided by Immigration, Refugees and Citizenship Canada, 98 applicants out of 109 have been approved to date. 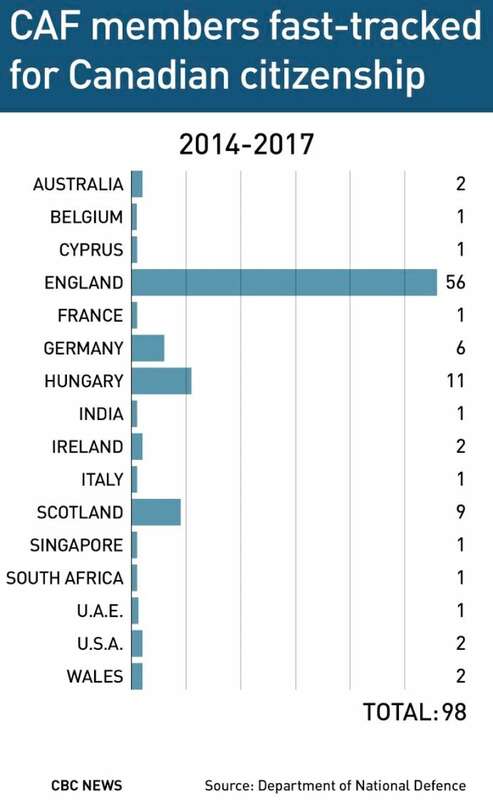 Of those applicants, 56 were from England; the remainder came from a long list of countries, including Australia, Germany, Hungary, Singapore, South Africa, the United Arab Emirates and the U.S.